with a team of surveyors from the Royal Navy. Stanley and the farm settlements. 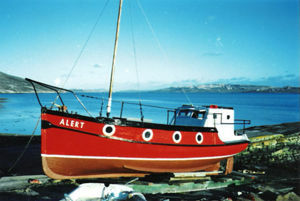 honoured with an MBE in 1976) the Alert continued her harbour work for FIG. the coastal lights and beacons in the Port William area, these structures being unrepaired since the early 1940s. Rabbit Island, and mutton on and off Bense Islands by towing a raft on which the sheep were carried. trials and during the numerous pleasure trips that she did over the next two years with the McRae family. Grytviken in South Georgia in November 1995. This page was last modified 14:34, 29 June 2009. This page has been accessed 6,254 times.